This is the first time Texas Tech has won this tournament against the top collegiate chess teams in the nation. Texas Tech “A” accepts its first ever PanAms championship trophy. 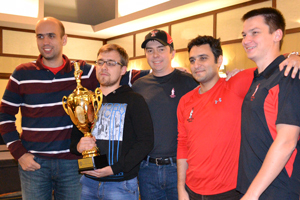 Texas Tech University's chess team, the Knight Raiders, recently won the 2015 Pan-American Intercollegiate Chess Championship for the first time in program history in Cleveland, Ohio, qualifying for the Final Four of College Chess in April. This is the third consecutive year Texas Tech has qualified for the Final Four. On the last day of the tournament, Texas Tech was behind the University of Texas-Rio Grande Valley (UT-RGV), Webster University and the University of Texas-Dallas by a half-point along with Columbia University and Lindenwood University. While UT-RGV and Webster made draws on each team member's boards on the final day, the Knight Raiders made their way to the top with two wins and two draws, beating out 10-time Pan-American champion UT-Dallas. The winning team included International Master Andrey Gorovets and Grandmasters Yaro Zherebukh, Elshan Moradiabadi and Andriy Baryshpolets. Texas Tech's Carla Heredia, a woman grandmaster, also was named the top alternate at the championship tournament. 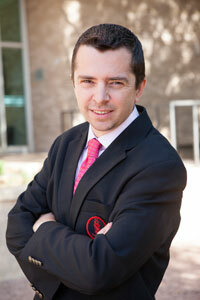 The chess program at Texas Tech, housed under the Division of Institutional Diversity, Equity and Community Engagement, is nationally known for its strong competition and leadership by coach Onischuk. Known as an international grandmaster, Onischuk is ranked as one of the top 100 players in the world and has been for the past 19 years. In the next two weeks, Onischuk said the Knight Raiders will begin their preparation for the Final Four, which will take place in New York City at the Marshall Chess Club.